Last week there was some discussion about Q over at the Jesus Blog (here, here, and here), including a poll where readers could vote on the existence of Q. (Maybe those guys are more influenced by the Jesus Seminar than they want to admit!) 🙂 I was already thinking about Q as I was in the middle of discussing it in my class on Jesus and the Gospels, but their reflections got me thinking about it a little more. I have been reading Benedict Viviano’s little volume, What Are They Saying About Q? (Mahwah, NJ: Paulist, 2013), which I picked up at SBL back in November. It provides a pretty decent coverage and focuses on the reception of Q along geographic lines (Germany, Britain, North America) and among Roman Catholic and Protestant interpreters of the NT. When you’re in the middle of academic discussions that have become second nature to you, you can occasionally become desensitized to some of the oddities in our profession. 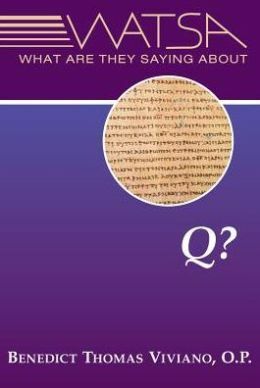 While I no longer give it a second thought, my students were astonished to find that the study of a hypothetical document could have its own label (viz., “Q studies”) and generate not only books like Viviano’s but numerous volumes claiming to provide us with a definitive look into the earliest Christian proclamation. (See here, here, and here, for just a few examples.) Those who study in our field realize that the study of Q is its own cottage industry, but when I stepped away for a moment and tried to see things through the eyes of my students I was able to understand how strange it seems that so much scholarly energy is devoted to performing redaction-critical maneuvers on a purely hypothetical text. Against that backdrop my students do seem to have a point. Several other thoughts about Q emerged this week as a result of our an earlier class session. On Monday of this week my class had the privilege of hearing from Dr. Mark Goodacre via video conference on the subject of Q skepticism. It was a treat for all of us. Mark is probably the most well-known skeptic of Q at the moment, and though my class had read his articles and listened to his podcasts on the subject, it was good for them to hear from him directly. Two things in particular stood out for me. One was an argument Mark made toward the end of the session–one I hadn’t heard him make previously. The last point on his handout argued that “agreement between Matthew and Luke is too close for Q.” In other words, the double tradition material is often so close (upwards of 20 words verbatim in some cases!) to have been generated by a shared work. Apparently he will be expanding on this observation in a forthcoming article. I look forward to reading his detailed argument. For the record, I have, up until recently, been an advocate of some form of Q, but I have become more and more skeptical over the past two years. And….full disclosure: I voted “no” in the Jesus Blog poll. Martin Hengel, The Four Gospels and the One Gospel of Jesus Christ, chapter 7, discusses and defends the order Mark Matthew Luke–with additional logia source material for Luke and Matthew. Allen, thanks for commenting. Did you mean to say, Mark-Luke-Matthew? That’s the specific order I mentioned in the post. Yes, I did mean Mark-Luke-Matthew. I think that’s what Allen must have meant to say. Hengel says Mark-Luke-Matthew in The Four Gospels. Riesner provides a response to Hengel’s argument in Earliest Christian History. Thanks, Wayne. I’ll check it out. Essential reading for the view is Ronald V. Huggins, “Matthean Posteriority: A Preliminary Proposal,” NovT 34.1 (1992) [www.jstor.org/discover/10.2307/1561093]. Mark (Goodacre) is familiar with this, so I assume he meant there has not been a monograph length treatment of the topic (not counting Adamczewski’s poor attempt; see Foster’s review summarized by Goodacre here). Another recent defense of Matthean Posteriority can be found in James R. Edwards, The Hebrew Gospel and the Development of the Synoptic Tradition (2009), chapter 8 (I found Edwards’ argument problematic on a few levels). I also knew of someone working on the topic for a PhD at a U.S. school a couple of years ago, but I cannot confirm its completion or publication. All this to say that the topic has received some attention but not nearly enough. Thanks so much, Josh. I’ll look into these. I do remember seeing Edwards’ volume but I never picked it up. Maybe I’ll order it and read it for the next time I teach this class. Hope your research is progressing well. The dissertation on Matthean posteriority is by Rob MacEwen, written at Dallas Theological Seminary. He finished it a few years ago. Mark’s basic argument against “Mark-Luke-Matthew”, if I remember correctly, was that we see signs of what could be understood as fatigue in Luke’s use of Matthew, but he could not find any for the other way around. When I first heard this I wasn’t entirely satisfied with the answer but after re-reading his article on fatigue I think it is fairly convincing. For Goodacre’s response to Matthean posteriority, see http://ntweblog.blogspot.com/2009/09/why-not-matthews-use-of-luke.html. FWIW, I think that Mike Bird (probably under Hengel’s influence) defends Matthean posteriority in a forthcoming work. Have you or your class reviewed Eta Linnemann’s work? Linnemann, a student of Bultmann, challenged the Q hypothesis: Linnemann, Gibt es ein synoptisches Problem?